We sometimes see small specks or clouds moving in our field of vision. These are called floaters. They can often be seen when looking at a plain, mono-colored background. Floaters are actually tiny clumps of cells or other materials inside the vitreous, (the clear, gel-like fluid that fills the inside of the eye). While floaters look like theyare in front of your eye, they are actually floating inside it. What we see are the shadows of the floaters on the retina. They can appear in a variety of different shapes and sizes. When the vitreous gel pulls on the retina, there is an appearance of flashing lights or lightning. These are called flashes. The flashes of light can appear off and on for several weeks or months. As we age, it is more common to experience floaters and flashes because the vitreous gel gradually pulls away from the inside surface of the eye. As we grow older, it is more common to experience floaters and flashes. When people reach middle age, the vitreous gel may start to shrink, forming clumps or strands inside the eye. The vitreous gel pulls away from the back wall of the eye, causing a posterior vitreous detachment. This is a common cause of floaters. When the retina detaches, it separates from the back wall of the eye and is removed from its blood supply and source of nutrition. The retina will degenerate and lose its ability to function if it remains detached. Symptoms of vitreous floaters include seeing specks (dots, circles, lines or cobwebs) moving in the field of vision. Symptoms of flashes include seeing flashes of light or stars. If the vitreous gel shrinks and pulls away from the wall of the eye, the retina can tear. This can cause bleeding inside the eye. A torn retina is always a serious problem and can lead to vision loss. Another type of flash comes in the form of seeing what resembles jagged lines or heat waves. This typically occurs in both eyes and lasts for 10 to 20 minutes. This is a very different form of flasher. Caused by a spasm of blood vessels in the brain, it is considered a serious threat to eyesight as well. Vitreous floaters may be a symptom of a torn retina. 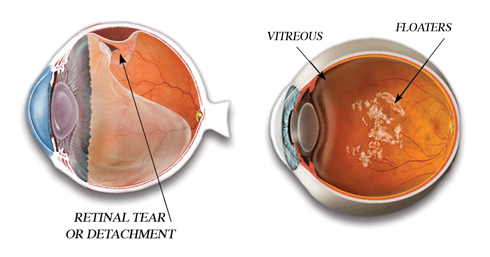 If a retinal tear is not treated, the retina may detach from the back of the eye. A very common treatment for a detached retina is a laser surgical procedure. Other floaters are harmless and fade over time or become less bothersome, requiring no treatment. Surgery to remove floaters is almost never required. Vitamin therapies will not cause floaters to disappear. If there have been floaters present for years, schedule an eye examination. Any sudden increase in the size or amount of floaters oflashes — especially if these symptoms are accompanied by any change in your vision.